This Cracked Out Pea Salad was a HUGE hit in our house! 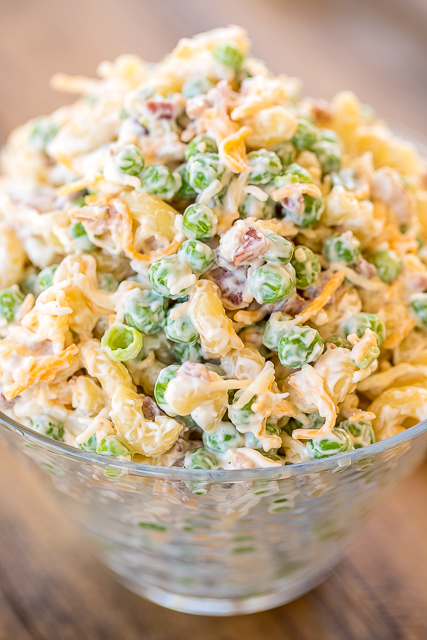 Macaroni, green peas, mayonnaise, cheddar, bacon and Ranch. Oh my! How could this not be delicious?!?! This Cracked Out Peat Salad goes great with grilled meats or a sandwich. This Cracked Out Pea Salad and some Olexa's Chicken Salad is our favorite lunch or quick dinner. Heck, Chicken Legs ate just this pea salad as his dinner one night. 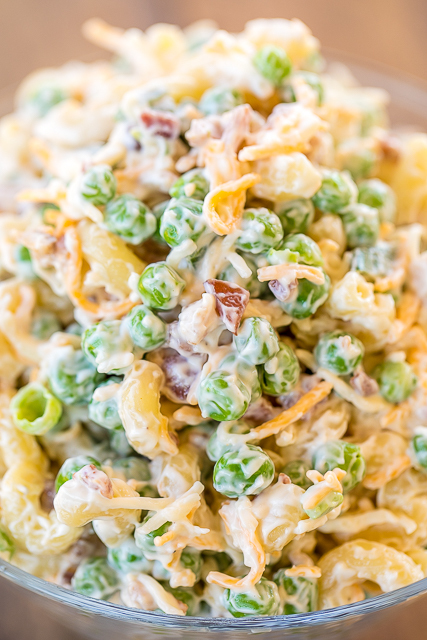 This Cracked Out Pea Salad is great for a potluck! The recipe can be easily doubled for a large crowd. We have been making a batch on Sunday and eating it with lunch during the week. It keeps great in the fridge. This will be a staple in our house this spring and summer! Give it a try ASAP! You won't regret it!! Cook macaroni according to package directions. Drain and cool. 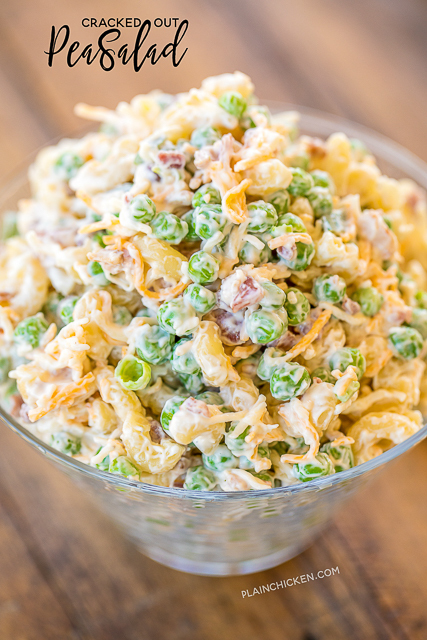 In a bowl, combine cooked macaroni and bacon, green onions, peas, and cheese. Whisk together mayonnaise, Ranch dressing. Pour over macaroni mixture and toss to coat. Looks great but I leave out the cheese and add hard cooked eggs. I used to add cheese but my husband doesn’t like it. Thank you, thank you, thank you! This is perfect for our church fellowship meal. Definitely not the same old thing that everyone brings. I can't wait to make it! Prepared ranch dressing just means the ranch dressing in a bottle, right? Not the one you make from a packet? Thanks! yes - bottled ranch dressing. Great. Thanks for clarifying! Can't wait to try this recipe. It looks delicious! I made this for a family gathering yesterday and it was a hit! This will be my go-to for the next family gatherings! LOVE ALL YOUR RECIPES....COULD YOU ADD TO THEM HOW MANY EACH DISH WILL FEED!!! I ALREADY DO!!!!! IT IS ABOVE THE PHOTO ON EACH RECIPE CARD!!!!! Is there bacon in this recipe? Also, how many does this recipe serve? My daughter made this for us. It is "shut ur mouth" good!